Sheila Brush, founder of Quiet Skies Puget Sound, pleaded for urgent action and calling on elected officials to advocate for change at the airport during the meeting on June 27. 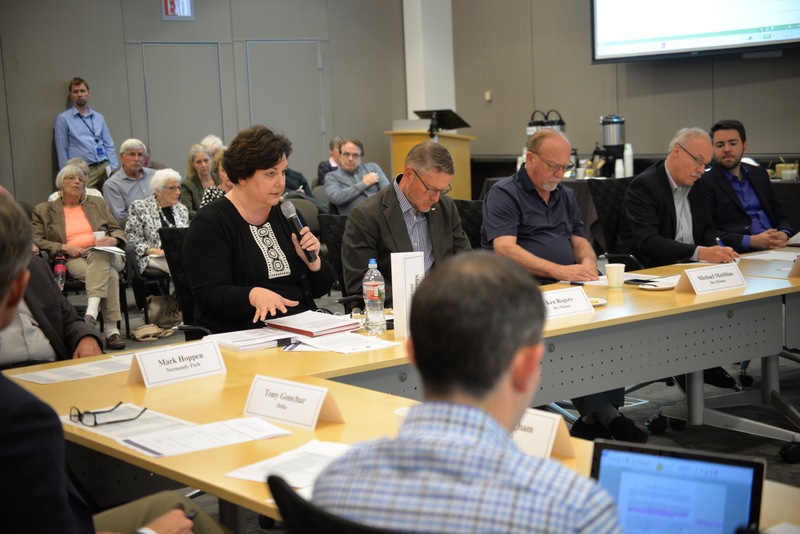 The third annual meeting of the Sea-Tac Stakeholder Advisory Round Table was held on the evening of Wednesday, June 27. The newly formed group meets every other month. Aviation director Lance Lyttle started the discussion by pointing out that the past couple of meetings were dedicated to discussion. Now, he said, is a time for action. “This meeting, and going forward, we want to focus on practical solutions,” he said. In response, committee members gave impassioned speeches about their concerns and what they’ve heard from their neighbors. A number of them said that growing airport operations are the elephant in the room. Mark Hoppen, city manager Normandy Park, argued that reduced airport operations should be the focus of the Port of Seattle and the FAA. Instead, he said community residents are asked to adjust to the flights by insulating against noise and putting zoning in place. Michael Matthias, city manager of Des Moines, agreed and added that frequency and timing of flights should be the top concern. Secondly, he wants to question the Day-Night Average Sound Level or DNL, the measurement used to quantify airport noise. “It has no bearing in reality,” he said. Ken Rogers, a Des Moines resident, asked that the airport push itself to ensure best practices are in place. Tejvir Basra, a business owner in SeaTac, wants to see cities take zoning into consideration. “We’re knowingly putting people in harm’s way,” he said. He said that people move to Seattle and buy affordable houses that end up being in a flight path. Sheila Brush, founder of Quiet Skies Puget Sound, said that action is imperative. She stressed that noise pollution is just part of the problem. She said health impacts, economic effects, air pollution, quality of life and risk management should also be considered. After committee members spoke, the meeting was opened to public comment. Larry Cripe, president of Quiet Skies Coalition in Burien, said that by increasing traffic in the air the airport created a fourth runway. “You’re using it on a daily basis without pouring a foot of concrete,” he said. Cripe said that the FAA and the airlines should sit down at the table for discussions. “If not, the citizens of this community are gaining strength every day and they’re going to start hearing from us,” he said. Jean Hilde-Fulghum, a Shoreline resident, said that while she is 25 miles north of SeaTac, flights have been more frequently disturbing her in her home. Hilde-Fulghum said that she is no longer able to work in her garden because of the noise and has to wear earplugs even inside her home. Lyttle encouraged committee members to choose their top three priorities and then form smaller work groups to determine the next course of action. “We don’t want to wait until every other month to work on something,” he said.